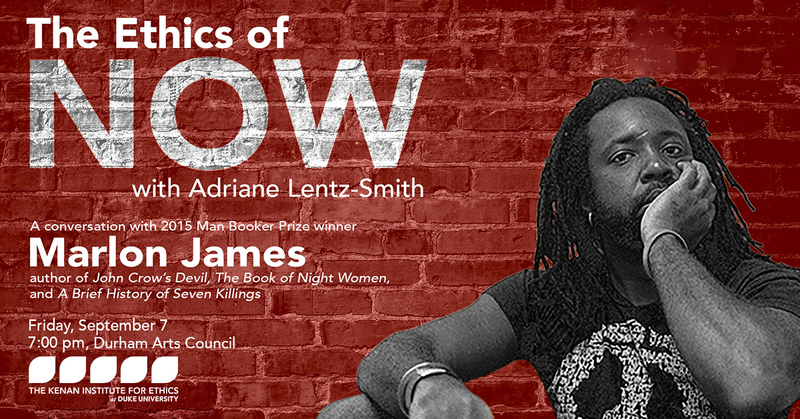 The Kenan Institute for Ethics kicks off its 2018 discussion series, “The Ethics of Now,” with a dialogue between renowned contemporary novelist Marlon James and Duke professor of history Adriane Lentz-Smith. **This talk is free and open to the public. Marlon James’s novel A Brief History of Seven Killings received the 2015 Man Booker Prize, making him the first Jamaican author to win the U.K.’s most prestigious literary award. The novel also received the 2015 American Book Award, was a finalist for the National Book Critics Circle Award, was a New York Times Notable Book, and was named a “best book of the year” by the Chicago Tribune, Washington Post, Boston Globe, Newsweek, Time and numerous other publications. Marlon James is also the author of The Book of Night Women, a finalist for the 2010 National Book Critics Circle Award in fiction and an NAACP Image Award. His first novel, John Crow’s Devil, was a finalist for the Los Angeles Times Book Prize for first fiction and the Commonwealth Writers’ Prize, as well as a New York Times Editors’ Choice. In 2018, James received an American Academy of Arts and Letters Award in Literature. “With powerful writerly vision and genius for creating voices that speak to the painful intensity of human experience, James crafts worlds that illuminate the brutal beauty of past and present,” says Lentz-Smith. Marlon James was born in Kingston, Jamaica, in 1970. He graduated from the University of the West Indies in 1991 with a degree in language and literature, and from Wilkes University in Pennsylvania in 2006 with an MA in creative writing. Since 2007, he has been teaching English and creative writing at Macalester College; he divides his time between Minnesota and New York. In his presentations, James addresses topics related to writing and the writing process, as well as issues pertaining to the history of the Caribbean, race and gender in the U.S. and U.K., and youth subcultures as expressed in literature and music such as hip-hop and reggae. His book Black Leopard, Red Wolf, the first novel in his fantasy Dark Star Trilogy series, will be published in February 2019.